Cubic Defence Australia is partnering with the University of Newcastle on training and career pathways for simulation. 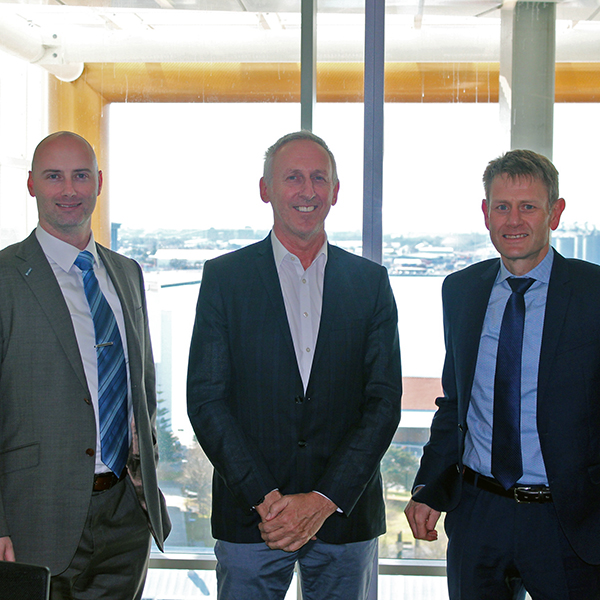 L-R: Evan Allitt, Program Manager Cubic Defence Australia; Professor Kevin Hall, Acting Vice-Chancellor University of Newcastle; Miles Macdonald, General Manager Cubic Defence Australia. Cubic's employees now have the option to study online units from the UON’s Bachelor of Computer Science degree. Program Manager Australian Defence Simulation Training Centre Evan Allitt said team members were excited at the prospect of gaining a degree in an area they are passionate about and being able to do it in conjunction with their employment. He said it was important for Cubic to invest in its people. “Improving the skills and future employability of our people is not just a moral obligation, but one that pays dividends in the workforce,” Evan said. Four units are initially being made available, with additional subjects to progressively be offered online. Pro Vice-Chancellor, Faculty of Engineering and Built Environment, Professor Brett Ninness said the University was delighted to be working with Cubic. “There are excellent synergies between the innovative computer science training and research at the University of Newcastle, and Cubic’s market-leading, technology-focused approach to Defence solutions,” Professor Ninness said. “We are excited to work with you to further our partnership and help provide training opportunities for your team,” he said. Senior Lecturer Dr Karen Blackmore said the units had previously been offered only on campus, and the partnership was driving the University to look at more flexible delivery of its programs. Dr Blackmore said work-integrated learning was a key part of the university’s programs, particularly at the undergraduate level, where students engage in industry as part of coursework. She said the university valued partnering with an employer interested in developing specific skills in its workforce, with a view to delivering both work requirements and course requirements simultaneously. Cubic and the University are also undertaking a case study on simulation workforce needs and are planning future collaborative research. The goal of the partnership is to establish a leadership and foundational understanding of the growing immersive simulation workforce and the skills needed to support simulation roles now and into the future.